Canapés is such a fun word. It comes from French origins and is pronounced kah/nah/pay. 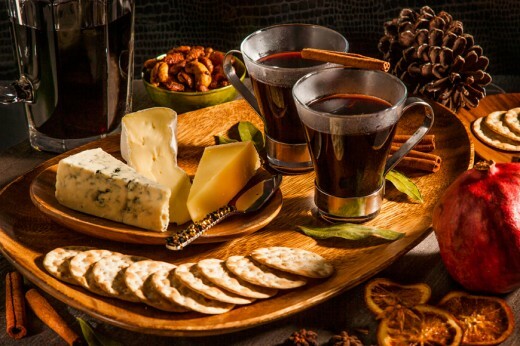 To me, it brings to mind elegant cocktail parties with glittering chandeliers, tall, handsome men sporting expensive black suits and beautiful women bedecked with sparkling jewels and chic evening gowns. There’d also be crisply-attired waiters, flitting here and there, passing out canapés on sparkling silver trays. While sophisticated scenes like that are fun to think about, it surely isn’t my world. 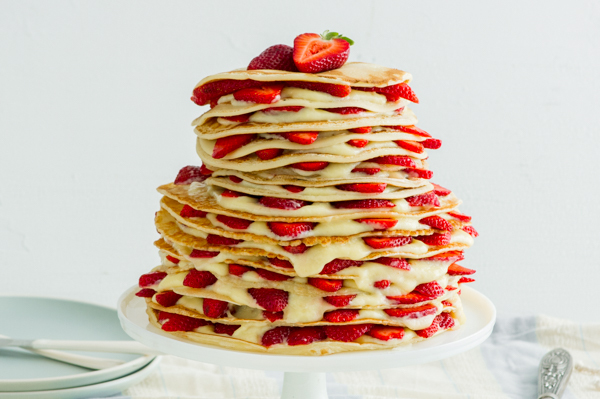 Nevertheless, I love to entertain family and friends, and serving delicious, eye-appealing food is right up my alley. I find it rewarding to put together a meal that makes my family and/or friends happy, one that elicits oohs, aahs, smiles and rave reviews. This past week we were invited to our son and daughter-in-law’s home for dinner. I took these delightful canapés to serve as an appetizer. They went crazy over the light, lemony goat cheese mousse, and commented on how well it paired with the crisp pumpernickel base, smoky salmon and fresh, feathery dill. 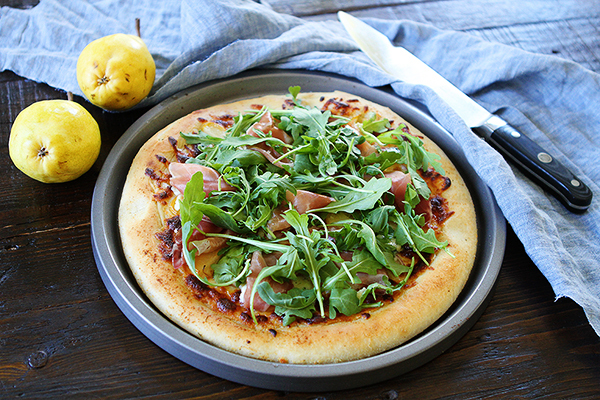 Whether your style is cocktail-party fancy or everyday-casual, this recipe is for you. The components can be made early in the day and the canapés can be put together in minutes before serving, making it perfect for low-stress entertaining! I used my KitchenAid® 9-Speed Hand Mixer with the Whisk Attachment to make the goat cheese mousse. It’s small, so it’s easy to store, but solidly built and the little motor just seems to purr. It’s also super easy to change from slow to high speed with one finger. 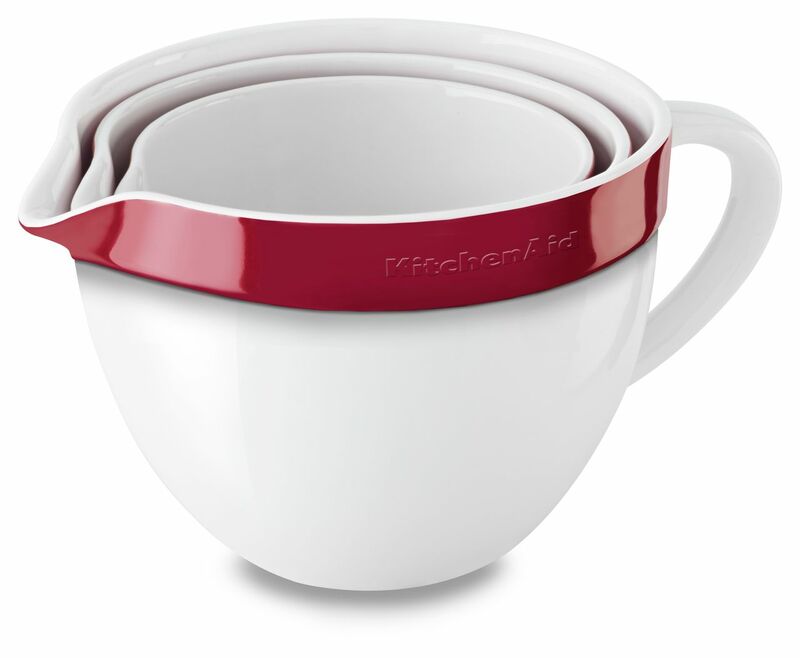 For mixing, I like to use the Ceramic Bowls from my KitchenAid® Ceramic 3-Piece Nesting Mixing Bowl Set. With it’s high walls and sturdy structure, the Ceramic Bowls help prevent splatter and keep your bowl firmly planted on your countertop while mixing. The combination of your Hand Mixer and Medium Sized Ceramic Bowl help make this process easy and clean! In addition to the 16-Tine Pro Whisk attachment I used for the mousse, the Hand Mixer also comes with Turbo Beaters (for cookie dough and cake batters), dough hooks (for yeast bread doughs) and a Liquid Blender Rod (perfect for smoothies, soups, sauces, etc.). Who else makes a Hand Mixer with all of that plus a handy little bag to store all the attachments in? To make your canapés, you’ll need some thinly sliced bread. I used pumpernickel because I think it’s heavenly with salmon, but almost any thin sliced bread will do. You’ll also need a bit of olive oil, a splash of heavy cream, Greek yogurt, goat cheese, lemon and a pinch of salt. Lay one piece of bread on a cutting board and flatten it with a rolling pin. Turn it over and roll it one more time, so it’s nice and flat. Using a small cookie cutter, cut out circles, squares, flowers; whatever shape(s) you like. I used a 2-inch square cookie cutter and was able to get two canapés from each slice of bread, but the yield will depend on the size of your cutter. Repeat with the remaining slices of bread. Place the bread cutouts on a parchment-lined sheet pan. Brush lightly with olive oil. Then cover with another sheet of parchment paper and another sheet pan. This will keep your canapés nice and flat. Bake for 10 minutes, then remove the top pan and parchment paper and bake another 10 minutes or until crisp. Next, you have to make the mousse. Mousse is another one of those French words that sounds quite fancy, but is actually very easy to make! First, whip up a quarter cup of heavy cream with your KitchenAid® Hand Mixer on a medium-high speed (6 or 7) in a Small Bowl. It took 20 seconds to go from heavy cream to perfect whipped cream. Whip together a log of softened goat cheese, a scoop of Greek yogurt, the finely grated zest of 1 lemon and a pinch of salt in a Medium Bowl using the Whisk Attachment on your Hand Mixer at a medium-high speed (6 or 7). Add the whipped cream to this mixture and mix on low speed (3 or 4), just until the ingredients are combined. Putting the canapés together is very simple. Line the crispy bread cutouts on a serving tray. Transfer the mousse to a disposable pastry bag or a zippered plastic bag. Snip a tiny corner off of the bag. Pipe a dollop of mousse onto each canapé. 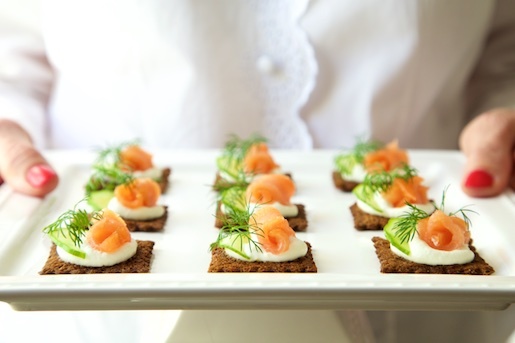 Top with a small piece of smoked salmon, a thin, half slice of cucumber and a sprig of fresh dill. Here you go, try one! I think you’ll be oohing, aahing, smiling and exclaiming rave reviews! Be sure to share your take on this Goat Cheese Mousse and Smoked Salmon Canapés recipe with us on Instagram using #MadeWithKitchenAid for a chance to be featured. Preheat oven to 350˚F. Line a sheet pan with parchment paper. Set aside. Cut another piece of parchment paper to fit a sheet pan. Set aside. With a rolling pin, roll each piece of bread until it is nice and flat. If the crusts are thick, trim them before rolling. With a small (approximately 2-inch) cookie cutter (any shape you want) cut as many pieces as you can from each slice of rolled bread (probably 2-3, depending on the size and shape of your cookie cutter). Place in preheated oven and bake for 10 minutes. Remove top pan and top sheet of parchment paper and bake for another 10 minutes or until crisp. Remove from oven and set aside to cool. For the goat cheese mousse, add heavy cream to the Small Bowl from your KitchenAid® Ceramic 3-Piece Nesting Mixing Bowl Set. Using the Whisk Attachment from your KitchenAid® 9-Speed Hand Mixer, whip cream on medium-high speed (6 or 7), until soft peaks form – about 20-30 seconds. In a Medium Bowl, combine softened goat cheese, Greek yogurt, lemon zest and salt in a small bowl. 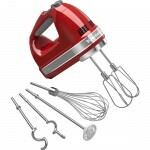 Mix with the Hand Mixer with Whisk Attachment on medium-high speed (6 or 7), until smooth and creamy, 20-30 seconds. To assemble the canapés, place crisp bread cutouts on a serving tray. Transfer mousse to a disposable pastry bag or a gallon size zippered plastic bag. Make a small snip at the bottom of the pastry bag (or off one corner of the zipper bag) and pipe 1-2 teaspoons of mousse onto each bread cutout. Top with a small slice of smoked salmon, a half cucumber slice and a sprig of fresh dill. Serve and enjoy!